Called “the most exciting individual in American theater” by Newsweek magazine, Smith (Fires in the Mirror, Twilight: Los Angeles) turns on this occasion to matters of the human body: the healthcare system, and the resilience of the spirit. In her signature style of interviewing an eclectic range of people (for Let Me Down Easy, over 300 on three continents), then performing as the interviewee in their own words, Smith creates an indelible gallery of 20 portraits, from a rodeo bull rider to a New Orleans doctor, as well as boldface names like former Texas Governor Ann Richards, legendary cyclist Lance Armstrong, and former supermodel Lauren Hutton. Let Me Down Easy was inspired by work she did at Yale School of Medicine, where she was visiting professor. Bill Moyers dedicated a full hour segment to profiling Ms. Smith and Let Me Down Easy. NBC’s Today raved, “Run – do not walk – to see this play! 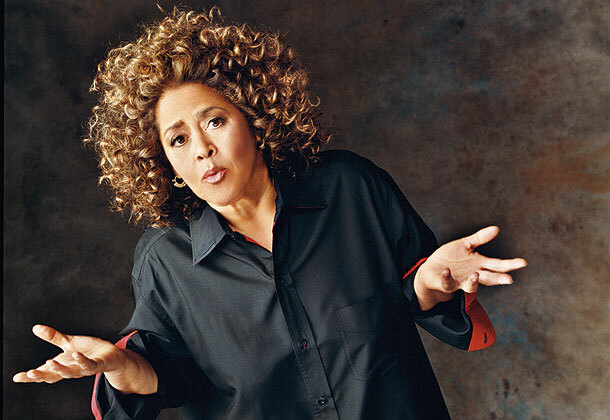 Watching Anna Deavere Smith on stage is magical. One minute you are laughing, the next you are crying. It is truly brilliant and stunning.” Variety heralded the work as “a totally vital piece of theater, mixing a standup comic’s instincts with a great reporter’s keen eye.” It was named one of Entertainment Weekly’s Top 10 of 2009. It has been said that Smith created a new form of theater. When granted the prestigious MacArthur Award, her work was described as “a blend of theatrical art, social commentary, journalism and intimate reverie.” She has performed in film and TV as well as on stage. She currently plays Gloria Akalitus on Showtime’s hit series Nurse Jackie. She’s probably most recognizable in popular culture as Nancy McNally, national security advisor on NBC’s former hit The West Wing. Smith’s Twilight: Los Angeles played around the U.S. and on Broadway. It received two Tony nominations, an Obie, Drama Desk Award, the New York Drama Critics Circle’s Special Citation and numerous other honors. She produced, wrote and performed the film version of Twilight for PBS. Another of her plays, Fires in the Mirror, examined a race riot in Crown Heights, Brooklyn (1991), when racial tensions between black and Jewish neighbors exploded. It received an Obie Award, numerous other awards and was a finalist for the Pulitzer Prize. She performed the play around the U.S., in London and in Australia. The film version was also broadcast on PBS. Let Me Down Easy – helmed by theater and opera director Leonard Foglia — will be taped during its run in Arena Stage’s Kreeger Theater in Washington, D.C. It will be directed for television by veteran Matthew Diamond (Cyrano de Bergerac, From Broadway: Fosse, Swan Lake with American Ballet Theatre, all for Great Performances, and was nominated for an Oscar for the 1999 documentary Dancemaker). After its Arena Stage run, the production will embark on a tour to include The Wexner Center for the Arts; Philadelphia Theatre Company; a collaborative presentation of San Diego REPertory Theatre, La Jolla Playhouse, and the Vantage Theatre; and Berkeley Repertory Theatre. Great Performances is funded by the National Endowment for the Arts, Vivian Milstein, the Irene Diamond Fund, the Starr Foundation, the Philip and Janice Levin Foundation and Joseph A. Wilson, with additional major support from the LuEsther T. Mertz Charitable Trust. For Great Performances, Bill O’Donnell and Mitch Owgang are producers; O’Donnell is series producer; David Horn is executive producer.